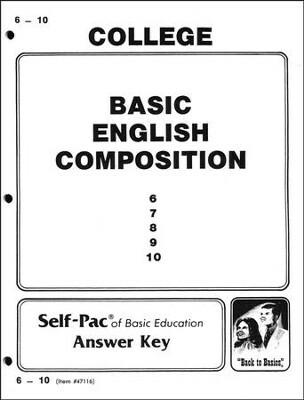 This single ACE "PACE"score key includes the answers for the sold-separately College Basic English Composition Self-Pac 6-10. Test and workbook exercises included; answers are line-listed. This key is three-hole-punched. Booklet. Intermediate/Original Edition. Q: What is this product. Answers to what? 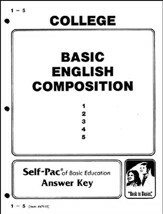 This is the answer key to English Composition PACEs 6-10. The CBD stock numbers are: WW6012482 (Book 6), WW6012483 (Book 7), WW6012484 (Book 8), WW6012485 (Book 9), WW6012486 (Book 10). 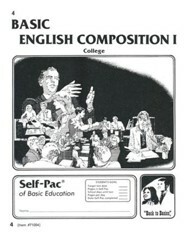 I'm the author/artist and I want to review Basic English Composition Key 6-10.